Anticipating that demand will double, MacLean Engineering has doubled its manufacturing plant capacity in Owen Sound. 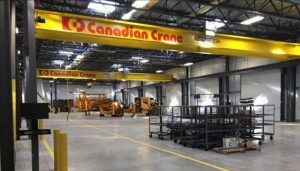 ONTARIO – MacLean Engineering cut the ribbon on a 1,400 m2 expansion of its Owen Sound manufacturing facility on April 8, 2019. The expansion doubles assembly capacity from five bays to 10, with two 10-tonne cranes. A separate storage building for parts and an external loading ramp for rig deliveries is also part of the plan. The project was initiated in the last quarter of 2018 and completed in the first quarter of 2019, utilizing local trades wherever possible. Currently, 140 staff are employed at MacLean’s Owen Sound plant. The expansion will eventually add an additional workforce of 50 to 60 people, including welders, machinists, electricians, mechanics and administrative functions. Visit www.MacLeanEngineering.com to learn how MacLean can electrify your underground equipment fleet.